There are certain games that I will never forget covering in my career. Some matches just stay in the memory, but for many different reasons. I’m sure you’ve got some too. The glory of promotion, the despair of relegation, the abandonment of a fixture, the clash against rivals. This weekend, Brighton and Hove Albion return to the Riverside to face Middlesbrough in the FA Cup 20 months after that fateful afternoon on the final day of the regular Championship season. A 1-1 draw, a red card and Middlesbrough promoted, while the Seagulls headed to the play-offs. I arrived at the ground early for the live outside broadcast with Danny Pike with that feeling, you know the one, this was a big day. I knew it. He knew it. The fans knew it. The players and managers knew it. 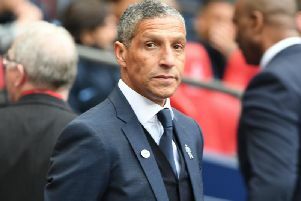 Of course a lot has happened since and now Chris Hughton and his squad have gone some way to eradicating the disappointment of that May afternoon. This week on Albion Unlimited on BBC Sussex, we discussed that result and what it meant for both clubs, but also what it means this weekend. Clearly the FA Cup isn’t the top priority but it could have a major impact on the Seagulls’ chances of survival in the Premier League. A run of one win in 13 has left the team perilously close to the bottom three. A difficult period was to be expected but on BBC Sussex Sport we have discussed at length the importance of being able to bounce back from poor results or performances. This weekend does provide a chance for the team, albeit a different starting 11, to break a chain of results. The win over Crystal Palace in the third round may not have galvanised the team against Chelsea to a win but there were promising signs. I’ve mentioned before that the next four weeks may determine Albion’s fate. No points are on offer this Saturday but the game can act as a catalyst. I’m sure the fans will want to leave the north-east with a better feeling than in 2016 and so will those players who suffered the agony of missing out on goal difference. It isn’t a case of payback; it is an opportunity to instil confidence, build momentum and rediscover that winning feeling. We all know how the euphoria can take you to a different level and the players and fans will want to draw upon the joy of any victory in the coming weeks. A long 15-hour round trip to Middlesbrough may not have been the first choice for anyone but it could become a significant date in the recent history of the club if it helps provide the inspiration to maintain the Albion’s Premier League status.